Cardok builds custom underground parking solutions all over the world. 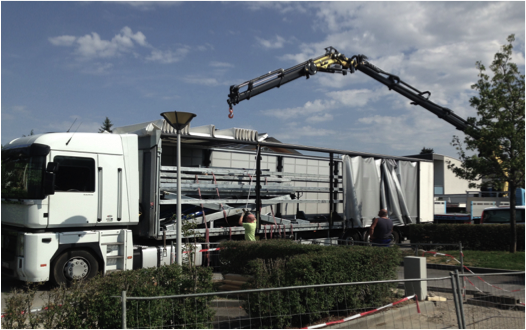 The installation requires an optimal synchronization between the delivery of the equipment and the installation team. By tracking the parking platform from the factory to the customer‘s premises, Cardok can send the installation team on site just before the parking platform arrives, thus minimizing idle time and reducing costs. All the parking platforms from Cardok are single projects. They are manufactured on demand at their factory and then delivered to customers all around the world. Once the convoy arrives at its destination, a team of skilled workers performs the installation. The coordination of the delivery and the team on site is therefore crucial. The process requires the renting and use of technical equipment such as special cranes, for which each hour of delay costs Cardok hundreds of dollars. As the journey can last from a few days across Europe to up to 2 months for destinations abroad, it is common that delays and problems occur along the way. In the past, the only way for Cardok to find out about the status of the delivery was to call the driver or contact the shipping company. This proved to be a time-consuming process with mixed results when people could not be reached or could not provide any information. Cardok recognized its need for a solution that would let them optimize the coordination between delivery and installation. Cardok is an underground parking solution that doubles your parking space and provides greater security than a locked garage. And it looks pretty good too. Cardok chose Kizy to have a solution that let it monitor and predict the delivery. Once a parking platform is ready for transport, the people at the factory in Switzerland attach a K-1 GSM tracker to it. Cardok can then comfortably monitor the delivery progress of the platform and share this information with the installation team. By means of an automatic notification, Cardok is informed about the arrival of the truck shortly before the final destination is reached and can send its team on site at the right moment to welcome the convoy. After completion of the platform installation, the team collects the tracker and sends it back to the factory to accompany the next delivery. Cardok uses Kizy systematically for all deliveries, which has resulted in an overall optimization of its supply chain. At all times, Cardok can follow the parking platforms from the factory to the customer and stays informed about delays. With the use of Kizy, installation processes have been optimized through perfect synchronization between equipment delivery and arrival of the installation team. In this way, Cardok has been able to minimize idle times and reduce installation costs, resulting in many hours and thousands of dollars saved per shipment.